Key scientific software packages are now available on our Office and Package discs. 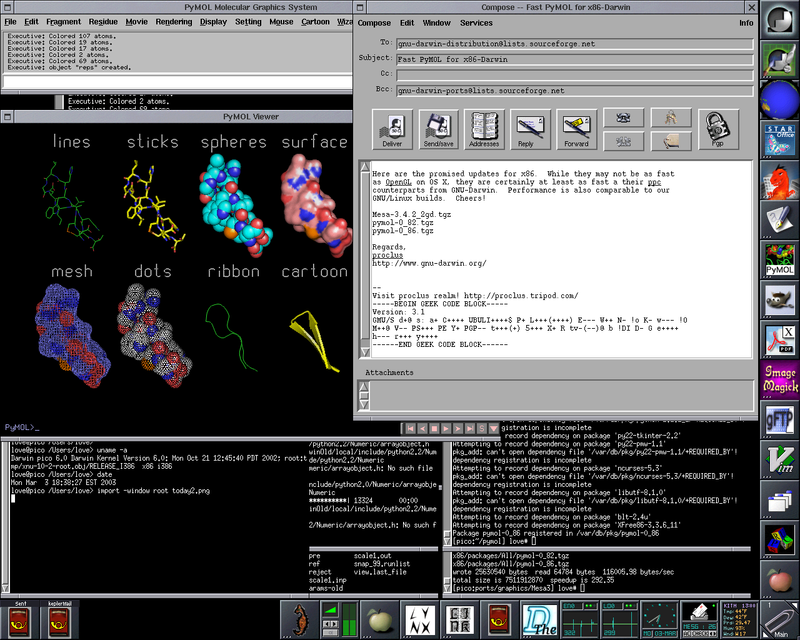 Favorite free software titles, first packaged for Darwin and Mac OS X by the Distribution, are included such as VIM, Ghostscript, Gnumeric, LaTeX, PyMOL (screenshot shown bottom left), Rasmol, gdFortran, LAM/MPI, AbiWord, GNUplot, and Raster3D. All are available for both x86 (Intel, AMD) and ppc (PowerPC) Darwin-only and Mac OS X systems. Worry-free open source and command line installation is provided, and binary software distribution means that no compiling is necessary. Easy access to updates is also provided via our automated download system (ppc, x86). As the premier free software distribution (founded Nov, 2000) for Darwin and Mac OS X, GNU-Darwin is clearly reliable with demonstrated stability and time-tested persistence. Our mature toolset has been successfully used for facilities administration, internet services, digital media production, intensive scientific calculation (see left center), authoring papers and progress reports (screenshot shown left top), high resolution graphics production, and all in a state of publication quality. With the assistance of a large open source development community, GNU-Darwin anticipates the needs of our users, and future Darwin utilities are provided in the present. 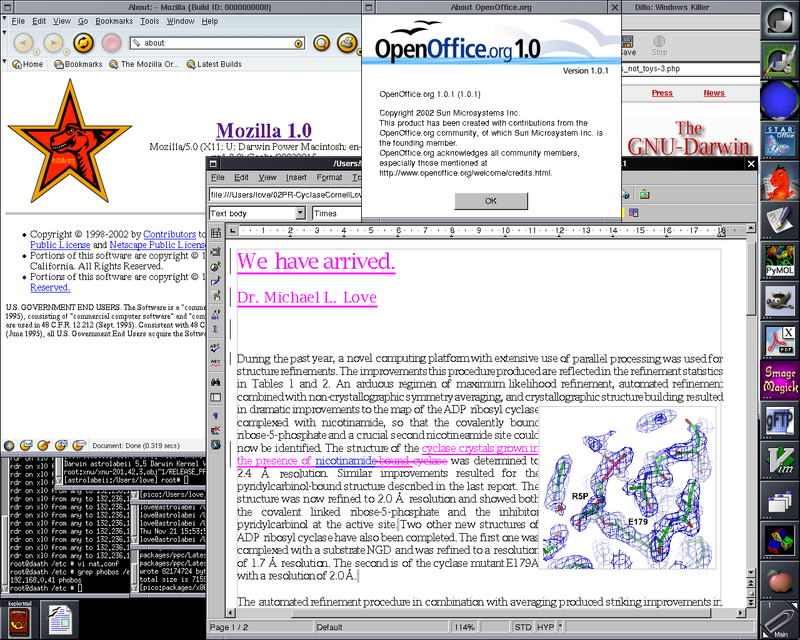 GNU-Darwin is expressly engineered for high profile enterprises and cutting-edge scientific applications, but it is also suitable for workstation use and free software afficionados as well. Only with these discs, will users be up and running fast and getting real work done with all the desired tools, both now and in the future. 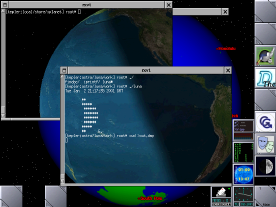 A number of key software offerings have been prepared for use with the GNU/Linux User Tarball. The package manager software for GNU/Linux is not yet ready for production, but these files should be ready to use. 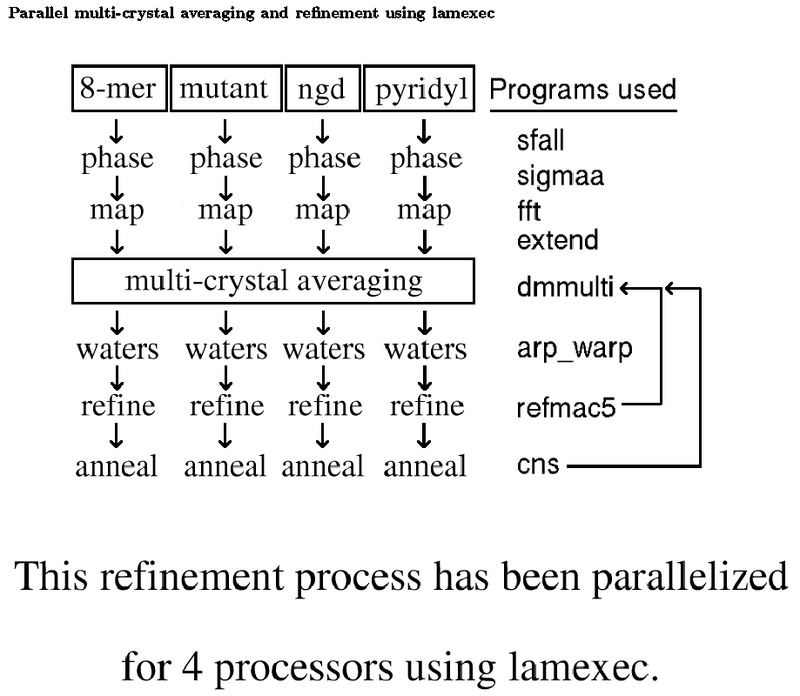 Just untar them in ~/usr/local, and try them with the parallel computing examples. 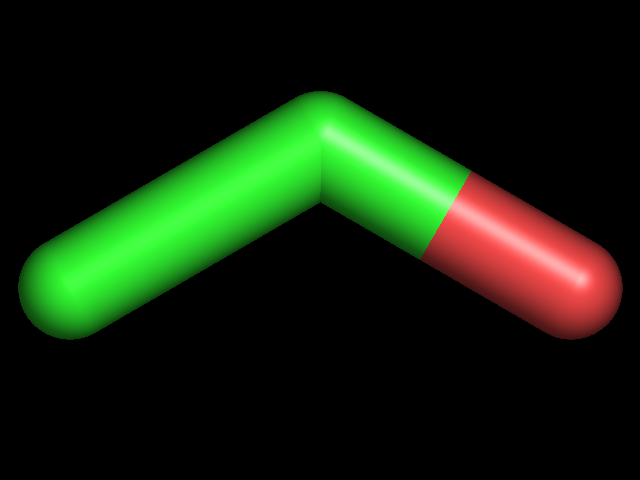 PyMOL is also included. Please read the alpha notice. If you have trouble with the User Tarball, try the latest files in CVS, or email proclus. For more information about the x86 platform, see the ports and packages page for GNU-Darwin-x86. Announcing GNU-Darwin-OSF1 for Tru64 Alphas! This a0 distribution includes gdFortran, PyMOL, Python2.2, GCC, Raster3D, and many other great free software offerings. Please read the alpha notice. 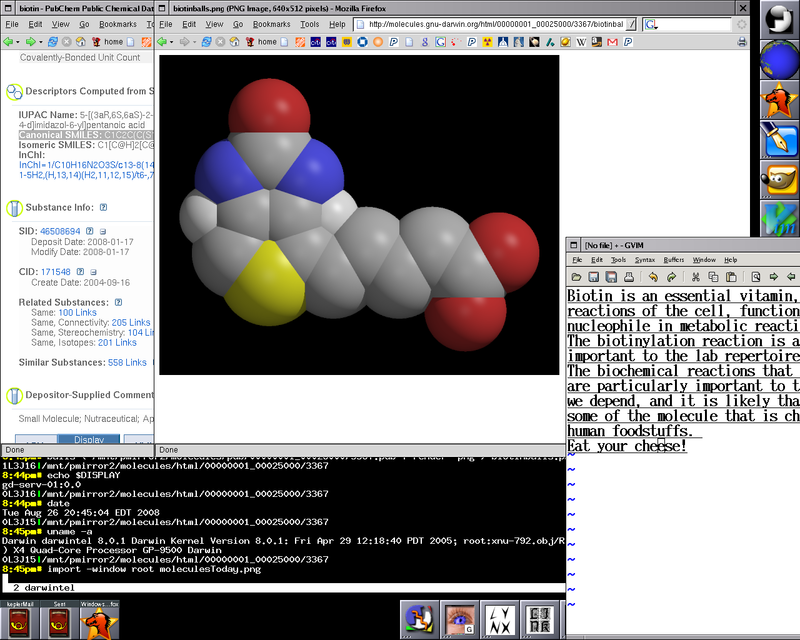 Pymol has been built for Tru64 Alphas using the GNU-Darwin/OSF $HOME ports tarball. If you want to try it yourself, then read the GNU/Linux instructions and adapt them accordingly. 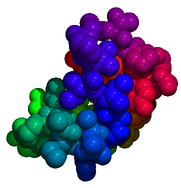 PyMOL-0.7.3 includes support for POV-ray, cartoon ribbons, transparency, and CCP4 maps. For the full update, including python-2.1.1, py-tkinter-2.1.1, povray-3.1g, and Mesa-4.0.1, run the following command. 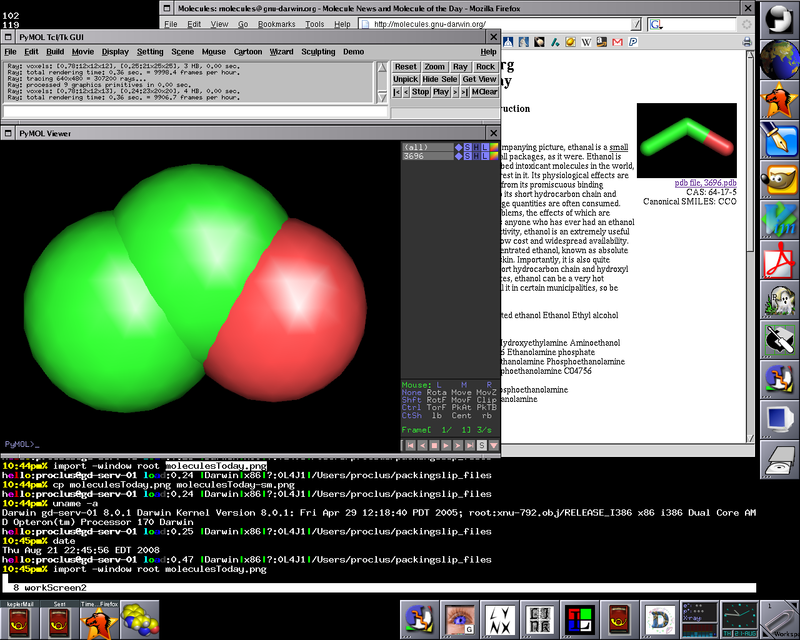 Here is a screenshot from the famous tangerine iBook, GNU-Darwin-ppc only installation (no OSX), stock, with 64MB RAM. Everyone please write to Stereographics development and sales to request Crystal Eyes for PyMOL and Apple computers. Read the letters from Drs. Love and Delano. 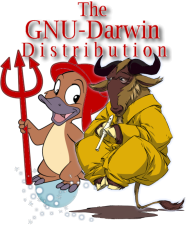 Donate: If GNU-Darwin is useful to you, then please consider contributing to the Distribution. Everyone can help. Logan Donaldson has a new build of MOLMOL, which is based on Mesa-4.0. We have created a number of Biology and Astronomy packages for Darwin-x86 users, gdFortran, Rasmol, and Raster3D included! More to come. 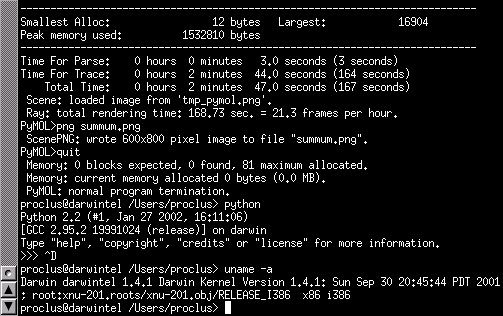 Check out GNU-Darwin-x86, for Darwin/Intel. Compiled Molscript sources are available from the Tenon third party apps page. GNU-Darwin Fortran, has been updated for building CNS. Be sure to read the package installation instructions and check out Logan Donaldson's CNS notes. Read more. Apple SciTech Group covered this development, which generated a little press. The PyMOL Molecular Graphics System has been ported to GNU-Darwin and Mac OSX. 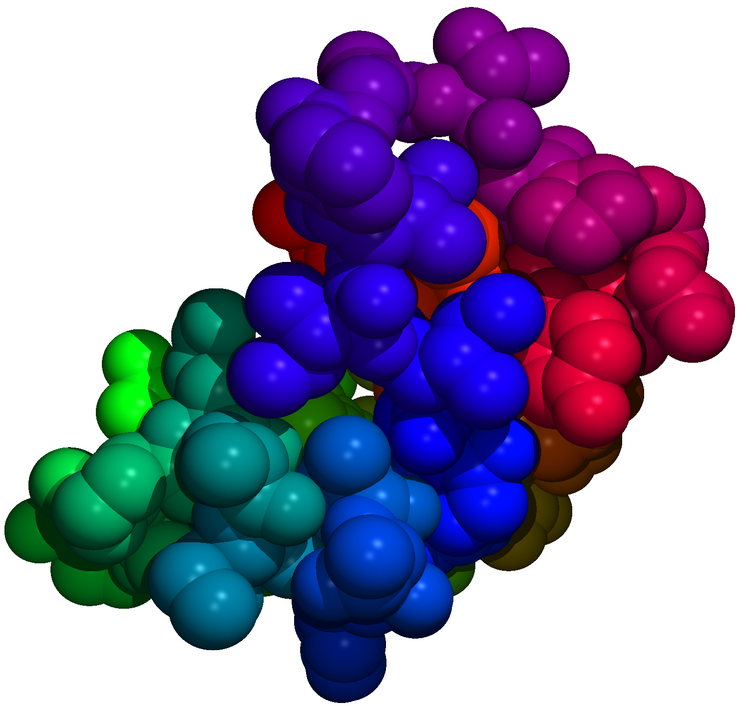 PyMOL is a powerful molecular graphics package for structural biology and other sciences. This interactive system is fully scriptable using the Python computing language, and it is free software! 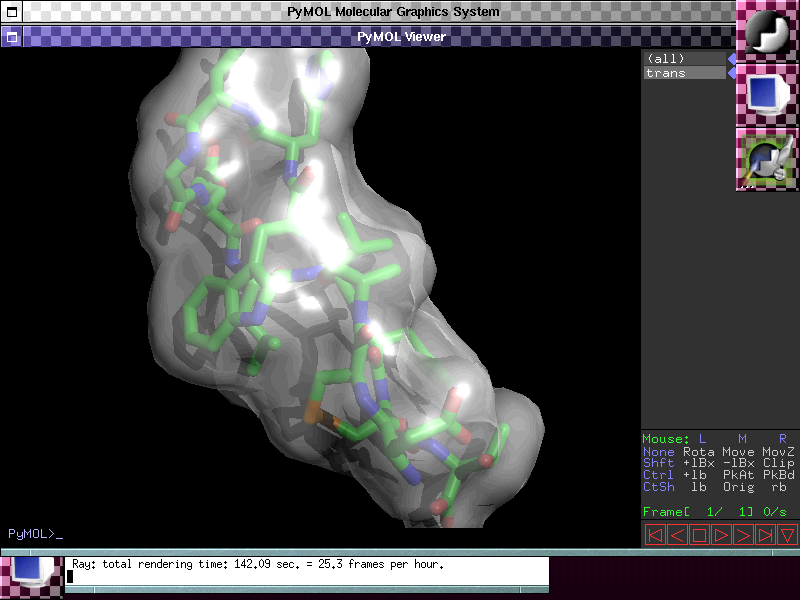 PyMOL is in CVS, and it will be added to the ports system. 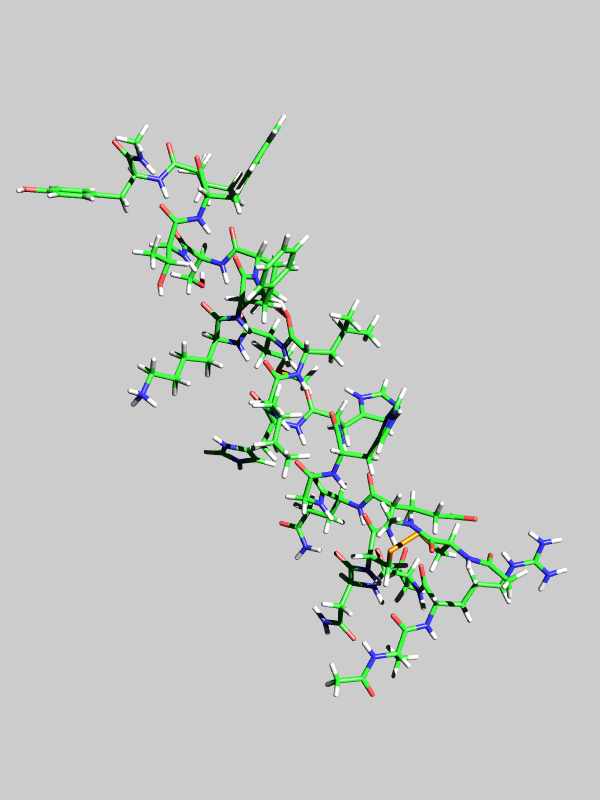 Pymol is an effective molecular builder, but it can also produce stunningly beautiful and realistic 3D graphics. Be sure to see the GNU-Darwin Art page for an example. 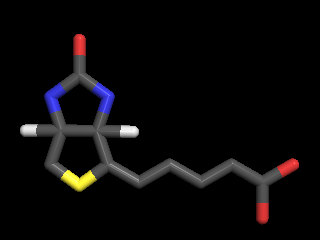 The GNU-Darwin build of PyMOL-0.60 is available now for distribution, along with the required dependent packages, tcl-8.3.2, tk-8.3.2, python-2.0.1, py-tkinter, and py-pmw. In addition, these packages also require XFree86-4.1 (see XonX). Be sure to read the package installation instructions. Incidentally, IDLE is a good editor/debugger for python scripts. 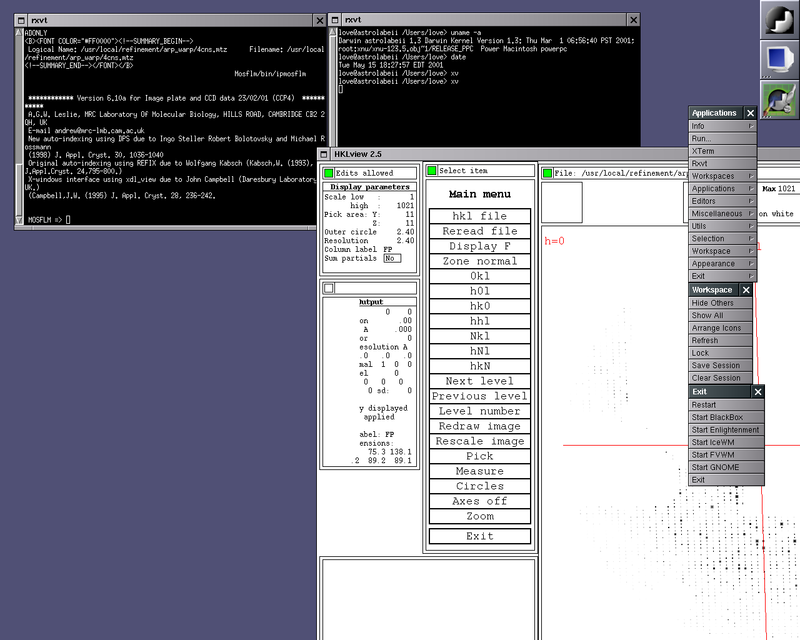 IDLE is also available from GNU-Darwin. Here is a link to our CCP4 porting tips page . CNS: no package available due to license restrictions. "YOU SHALL NOT DISCLOSE IN ANY FORM EITHER THE DELIVERED SOFTWARE OR DOCUMENTATION OR ANY MODIFICATIONS OR DERIVATIVE WORKS BASED ON THE SOFTWARE OR DOCUMENTATION TO THIRD PARTIES WITHOUT PRIOR WRITTEN AUTHORIZATION." POV-ray: with package available POV-ray builds automatically with the ports system. Be sure to consult the package installation instructions. PovScript: no package available due to license restrictions (see Molscript). Molscript with GL: no package available due to license restrictions. "The LICENSEE shall not disclose in any form either the delivered SOFTWARE or any modifications or derivative works based on the SOFTWARE to third parties without prior written authorization from the LICENSOR." Tip: There are compiled molscript sources available from the Tenon third party apps page. Mosflm: Here is a screen shot. Mosflm is now part of CCP4. Mosflm has been ported, but not yet tested to our knowledge. DPS should be ready soon as well! * The code will be optimized for the parallel architecture of an Apple G4 dual processor super cluster. William Van Etten of Blackstone Technology Group has kindly provided the building instructions for EMBOSS, the sequence analysis suite. I do crystallographic consulting for data collection, refinement, and molecular graphics; with much synchrotron experience and particular expertise in the Supper Mirror System. I'm also a Physical Chemistry consultant specializing in water vapor equilibria in medical devices. Please feel free to contact me, if you want my help in porting these programs to your Mac, cheap laptops, or anything else. Here are links to my cv and NIH Biosketch. Now you can do real science on your Mac! 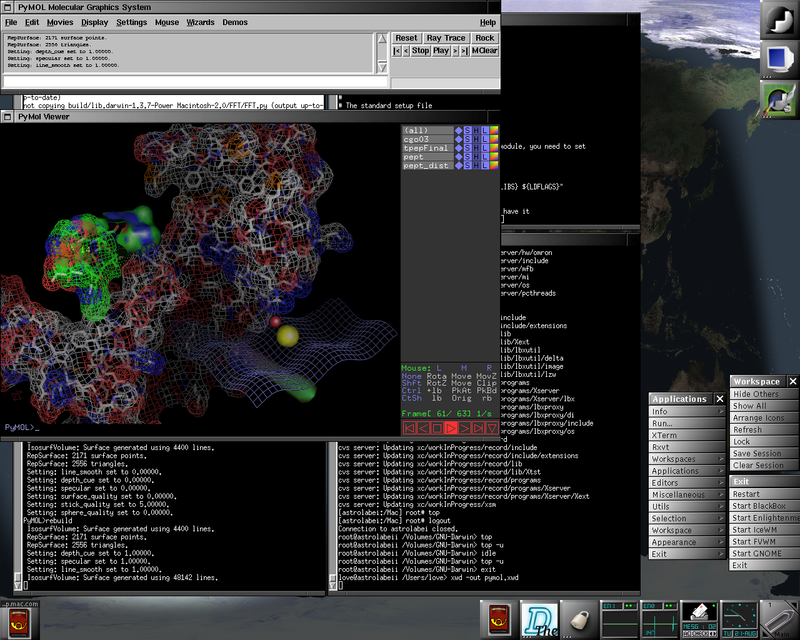 I have ported a variety of scientific computing programs to Darwin. In order to facilitate this work I have created a Package Distribution of Darwin and MacOSX software.